The investigation into the invasion of a Puruni mining camp on November 15, which ended in assault, has been completed and the police will soon send the file for legal advice, Divisional Commander Senior Superintendent Ravindradat Budhram said on Wednesday. Budhram said that police investigated a report of assault as Brazilian Raimundo Malhaeo sustained a wound during the incident. He stressed that the invasion was not a robbery. There had been reports that the incident was fuelled by a longstanding dispute over the land the mining operation is located on. 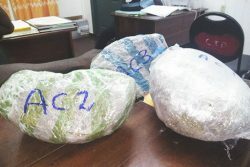 Asked whether investigators were able to confirm this, Budhram told Stabroek News that a Guyana Geology and Mines Commission (GGMC) team travelled to the area to investigate the report of a land dispute, while the police investigated the assault. He said too that the names of three businessmen were called as being part of the invasion, and this was subsequently published in a section of the media. But when they were interviewed it was found that this information was inaccurate; they were nowhere near the camp site at the time of the attack. A relative of one of the businessman had told this newspaper that at the time of the attack, the man was in church at Bartica. The relative insisted that the pastor as well as an entire congregation can confirm this. Stabroek News had been told that nine gunmen had stormed the camp around noon on the day in question. Malhaeo, who is the brother of the camp owner, was in charge when the group stormed in and allegedly demanded gold. The source said that when Malhaeo said there was no gold, he was beaten about the body and gun butted to his head. The gunmen, the source alleged, then threatened to killed Malhaeo and the other workers if they were still there when the group returned the following day. According to the source, the workers at the camp said they recognized the three businessmen and this information was passed on to the police. Camp owner Nide Carneiro Malhaeo was not at the camp at the said time. It was explained that he had bought four mining blocks for $60 million in the Puruni area but only received paperwork for one. It was said the miner was on the block he legally owns, but that one of the businessmen had apparently sold the block to another person. The camp owner expressed belief that the attack was to scare him off, the source said.